Deep in the cold and dusty corners of the universe, baby stars are formed. When a molecular cloud (aka an interstellar dust bunny) made out of gas and small dust particles reaches a critical density, it begins to form protostars as the gas in the cloud gravitationally collapses. Scientists can study these stellar nurseries to understand how gas is transformed into giant stars. Unfortunately, molecular hydrogen, which composes ~99% of a molecular cloud, is hard to measure at the low temperatures clouds form at. Instead, the dust in the clouds is studied, as it behaves in a manner similar to the gas. Recently, Mike Chen and his collaboration investigated several stellar nurseries in one molecular cloud, Perseus, in order to map the temperature and other parameters which they use to understand the evolution of dust grains in the regions. They look primarily at the regions’ temperatures and a parameter called the dust emissivity spectral index, or beta. This index is critical to estimating the mass and temperature of the star-forming structure and is dependent on the properties of the dust grains, like size and composition. Using the JCMT sub-millimetre telescope, the group derived maps for temperature, dust emissivity spectral index and optical depth (i.e. how well you can see through it). Plotting known stars and young stellar objects on the map, they were able to see relations between these objects and the dust grain properties. The results from the temperature maps showed distinct warm regions within the clouds, though by warm we only mean about 15 K (-430 F). Most of the areas that had above average temperatures also had a young stellar object, which is likely responsible for the region’s extra warmth. However, not all regions containing young stellar objects were warm. It could be that these regions contain particularly infant objects that haven’t yet had the time to warm their dust blankets. 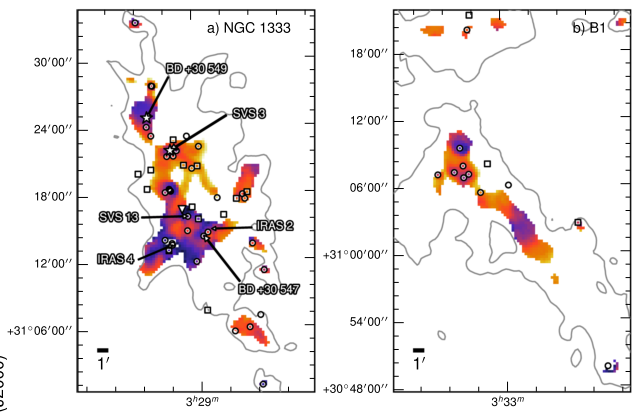 Temperature maps for two dense regions in the Perseus molecular cloud. Red indicates higher temperatures and blue, colder. Circles, triangles and stars indicate young stellar objects and stars. 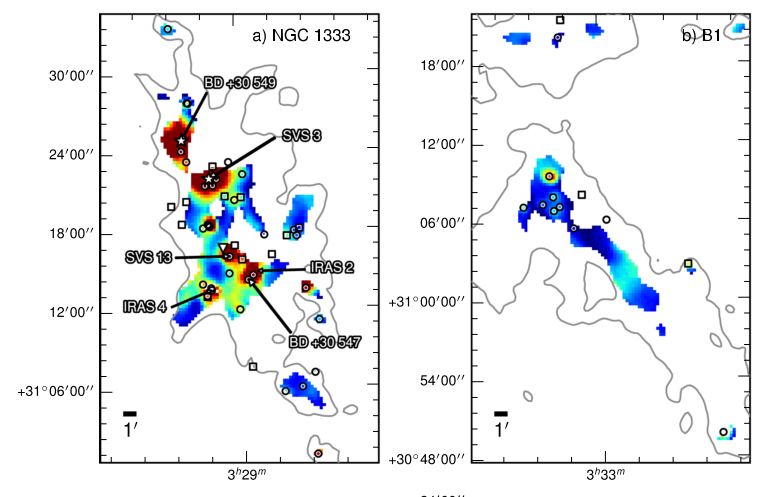 Examination of the dust emissivity spectral index maps showed significant differences between star-forming clumps in the Perseus molecular cloud. Furthermore, the group noticed smooth structure on small scales which indicates that the dust emissivity spectral index is affected by its local environment. Different clumps in one cloud showed different distributions of the index. This shows that the dust grains are probably growing significantly as the clump itself evolves. Dust emissivity maps for two dense regions in the Perseus molecular cloud. Yellow indicates regions with higher emissivity index and blue, lower. Circles, triangles and stars indicate young stellar objects and stars. When comparing the dust emissivity spectral index and temperature maps, Chen and his collaborators noticed the colder temperature regions tended to have higher beta indices. This could indicate an evolution of the dust grains. As the temperature drops, ice can begin to grow on the dust grains, giving them a larger size and thus a higher beta index; In warmer regions where stars are forming, this ice sublimates and the index is lower. In other words, the beta index decreases when the grain size increases. A grain with a ice mantle, however, can have a higher beta index compared to a bare grain of the same size. However, it’s a complicated picture and another theory suggests that instead large grains are produced in the densest gas near protostars, which are typically warm. While this work begins to probe the origin of dust grains with low dust emissivity indices, further observations are necessary to see the full picture of grain evolution.